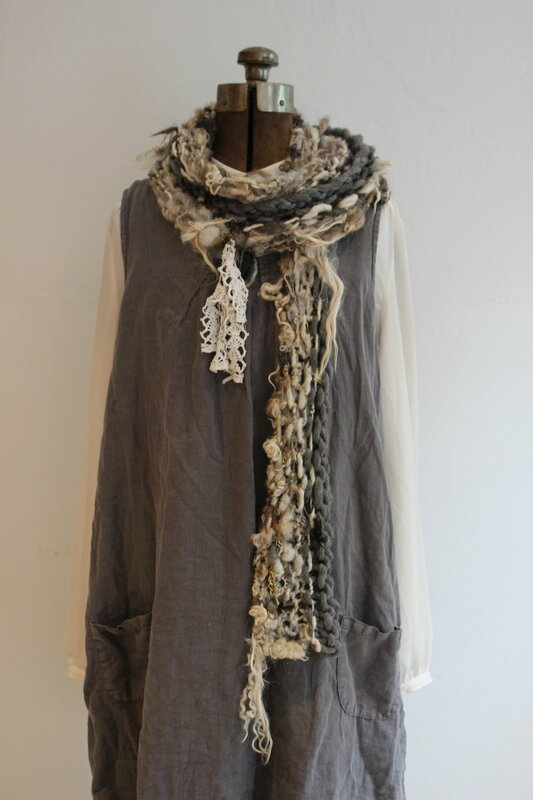 This tunic top can be worn frontwards or backwards, or as a cowl. I love creating art yarn pieces that are multi functional. 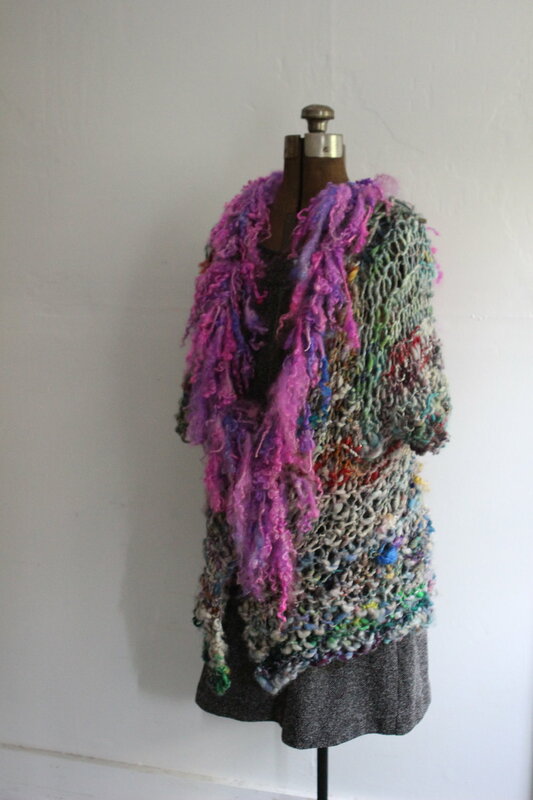 For the front of my tunic I used 30 yards of recycled sari silk ribbon. This ribbon was sewn together from black to a small strip of blush pink and then ivory. Then for the back of the tunic I used 30 yards of handspun boucle textured yarn in a double elongated stitch. I knit the sari silk into a rectangle, and the boucle into a rectangle, and then I seamed the shoulders and sides - leaving plenty of room for the armholes. 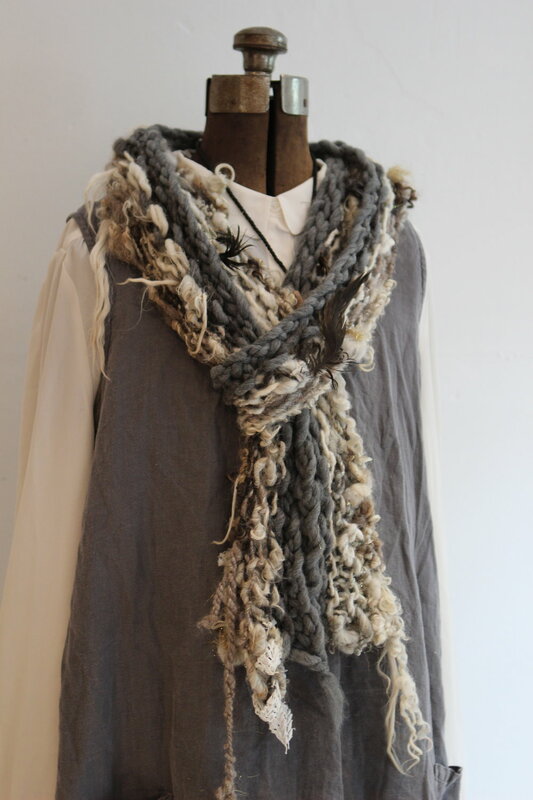 To wear this tunic as a cowl, just drape it around your neck and use one of the armholes as the second wrap to shorten. Knit in a double elongated stitch until the piece reaches 20 inches long. Seam the shoulders together with a crochet hook and yarn, matching the necklines of the front and back. You can adjust the width of the shoulders by seaming more or less yarn from the sides. Seam the sides together with a crochet hook and yarn - leaving large holes for the arms. For a ruched effect, pull the extra ten inches of the back up and seam to the corner of the front side. This scarf uses Homestead Wool's Wensleydale lash yarn plus a thick and thin merino wool to make a cozy scarf with lash yarn to spare! You are making this the width you want, so cast on as many stitches as you would like if you would like to wrap it several times. 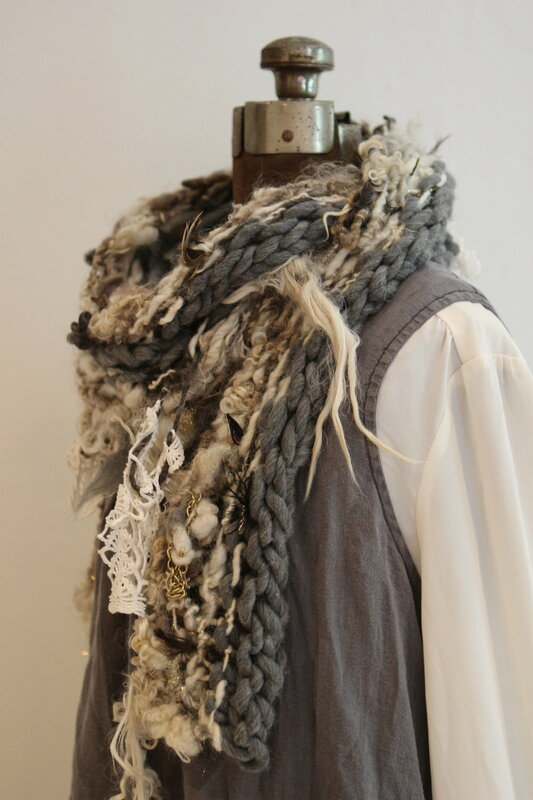 This was made to be shorter, and to incorporate a pretty pewter button. You only knit the lash yarn every few rows, but feel free to use it on more rows if you would like more drama! 1. 90 yds thick and think merino (I used Aslan Trends Del Sur (Discontinued), but maybe try some handspun too! Cast on 70 stitches with the thick and thin merino. Work in Stockinette Stitch (knit a row, purl a row), for two rows. On the next row (knit row) add in the lash yarn, and knit it along with the merino. On the next row (Purl), drop the lash yarn and continue in SS for two rows. Repeat knitting with both yarns for the next knit row. Bind off using Merino yarn only. Sew on a button, or use a shawl pin. 10 yards of bulky art yarn (I used a yarn with "twists" spun into it to make fringe - you could also use "tailspun" style art yarn with long locks for your fringe). Cast on 8 stitches with your bulky yarn. Knit the entire bulky yarn skein using the Raspberry Stitch in the video below. Bind off and weave in the ends of bulky yarn. This video shows you how to work the Raspberry Stitch, also known as the Trinity Stitch. Pattern instructions: Rows 1 and 3: Purl all stitches Row 2: K1 *(K1, P1, K1) into next stitch, P3tog* K1 Row 4: K1 *P3tog, (K1, P1, K1) into next stitch* K1 Repeat these four rows for the pattern. 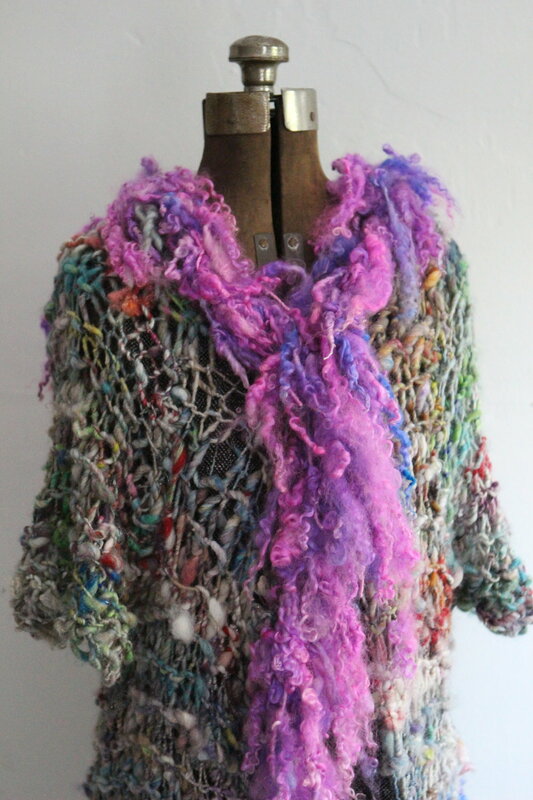 This is a great 20-30 minute scarf for featuring handspun art yarn. Add as many different yarns as you like in all different colors. 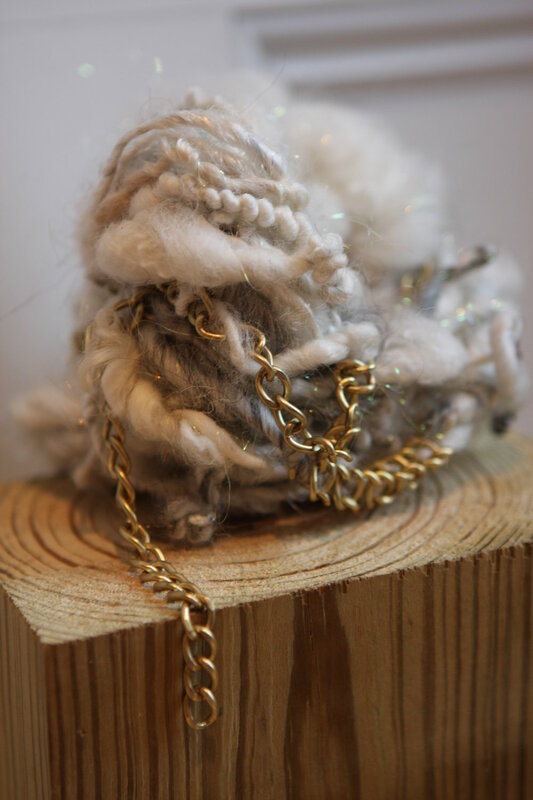 For this yarn I used a bulky handspun yarn spun from local natural wool locks, a thinner yarn plied with chicken feathers, and a commercial yarn by Loops & Threads called Woolette in the color Gold (Yarn is discontinued; use a bulky/super bulky with texture for a similar look). Below is a video if you've never arm knit before to teach you how to make this scarf stitch by stitch. Cut Yarn C leaving a 18 inch long tail. Seam the edges together with the tail of Yarn C, but only seam up halfway, leaving half of the rectangle to hang open for extra drape and shaping. This is a easy blanket pattern you can complete in an afternoon. This pattern can be customized to any square size. Since you are knitting it from corner to corner (on the bias), it will always turn out square regardless of the size. I've attempted to knit several bulky art yarn blankets from top to bottom, and always end up with an awkward rectangle because I cast on too many or too few stitches and then run out of yarn. Knitting from corner to corner works best for me. Knitting on the bias works great, and it adds a design element too! The pattern is below, but to create the striped / textured effect on your blanket simply rotate through your stash of handspun & commercial yarns while you knit, creating stripes of colors and textures. Knit big stripes or little stripes. Whatever looks beautiful to you. I did not include my exact stripe pattern (how many rows with yarn A, how many rows with yarn B) because my yardage of each skein will be different than yours. Now start decreasing to make a square. Knit 2, Drop stitch, Knit Two (this center dropped stitch will create the loose dropped stitch row from corner to corner of your blanket). Gently unravel the stitch. When you have two stitches on your needle, bind off. Create Tassels for the corners of your blanket by following the video tutorial below and attach to each corner of your blanket. My tassels are 8 inches long and I used about 20 yards of chunky weight handspun yarn for them. 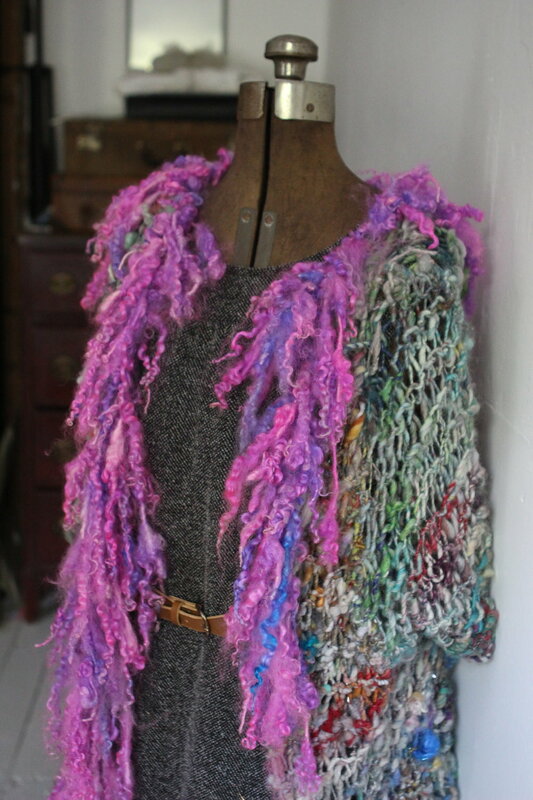 This scarf is great for displaying your most textured handspun art yarns. I used commercial yarn to break up the texture. It is knit length-wise. Knit flat in garter stitch, alternating rows of commercial yarn and handspun art yarn based on what you are working with in your stash.